Remember that cool 80s movie Purple People Eatery with Neil Patrick Harris and the one-eyed monster? Yeah, we don’t either. Thankfully, the owners of the psychedelic Purple People Eatery do remember it. In fact, so much so, that they’ve based their food truck menu and décor off the cinematic creation. I was so psyched to finally eat at the odd, attention-grabbing purple food truck that always stands out among the masses. I started my culinary adventure with the Black and Bleu burger ($8) from the Blackened Bison Burger menu. 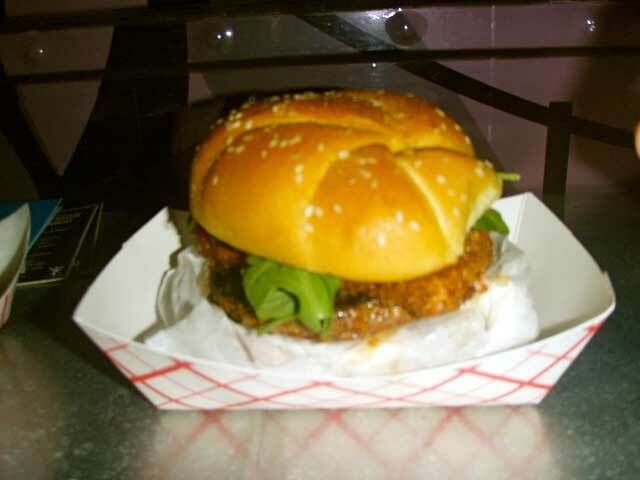 Topped with bleu cheese, barbeque sauce, Roquette arugula and tomato, there was nothing scary about this awesome find. It was flavorful and bold. Other burger selections off the bison menu include the California ($7) and Classic ($6) burgers that also have their fair share of innovation. Although burgers are prevalent on the menu, the Purple People Eatery also takes great pride in serving up a feast for vegetarians. 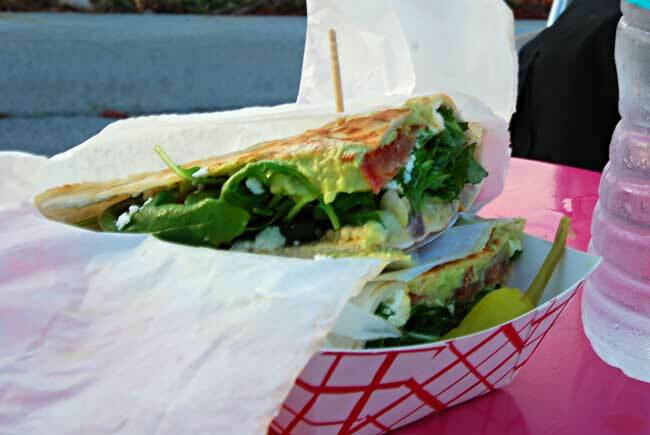 Specifically, the Club Med ($7) is a pita stuffed with veggie bacon, olives, onions, cucumbers, tomato, hummus, baby arugula, feta cheese, and avocado sauce. Consider it full-blown indulgence for veggie lovers. 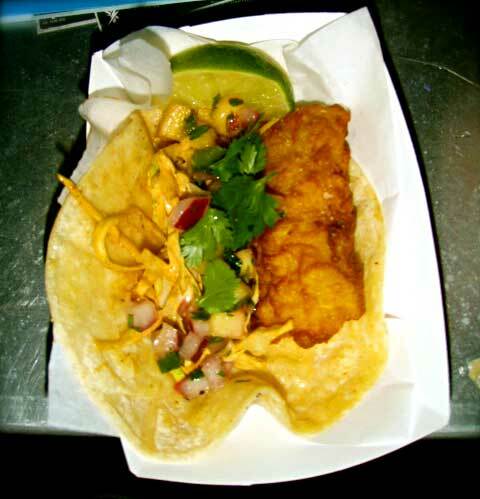 Being the seafood lover that I am, I also tried the Mahi-Miami fish taco with pineapple-jalapeno salsa, battered in ginger beer. It was fresh, and the flavors blended together masterfully ($4 each, or two for $6). I caved in to peer pressure, and tried the Mac and Jack ($5). 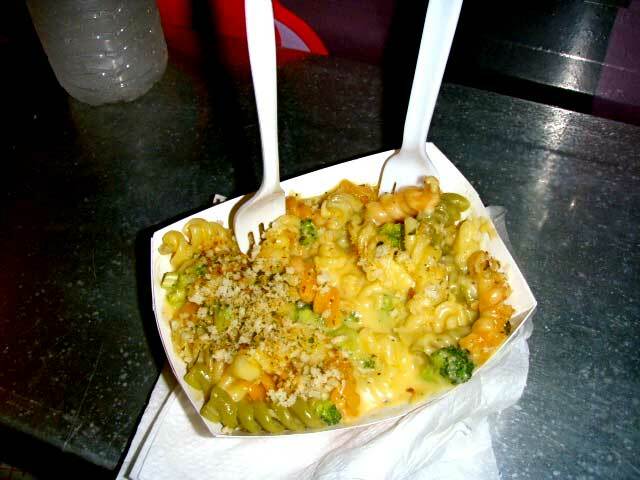 A concoction of herb–crusted broccoli Mac n Cheese comprised of an array of cheeses, including Jack; Monterrey; Colby; sharp Cheddar; and smoked Gouda. This was one diet cheat treat I’d give in to over and over again. I was lucky enough to catch this monster truck amid the popular Wynwood Gallery Art Walk. 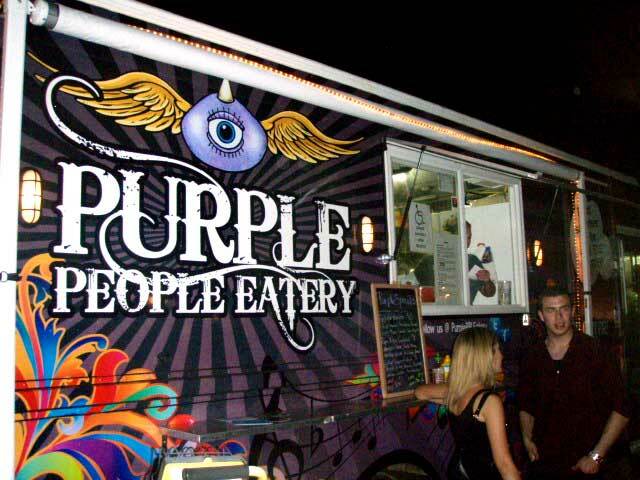 To celebrate the monthly event, Purple People Eatery had a specialty menu with one-time offerings like the Ropa Vieja sandwich and the Grilled Smores sandwich. I recommend being adventurous in your selection and trying one of these rare masterpieces, if available. Who knows when you’ll be around for another purple monster spotting! Prices range from $4 to $8. I’ll have to try them next time! Thanks Matthew for your comment! Remarkable things here. I’m very glad to look your article. Thank you so much and I am having a look forward to touch you. Will you please drop me a mail? stuff from. I appreciate you for posting when you have the opportunity, Guess I’ll just bookmark this page.